Welcome back to Malvern’s finest, and TFC’s still leading goal scorer. Yes, he’s older. Yes, some unfortunate stuff went down between the man and TFC last time around. Critics might call him ego driven or over the hill or even ungrateful. And yes, he could wash out this season without ever making a major contribution. I just wouldn’t bet on that. DeRo is a big-game player. He is the guy who makes something out of nothing. He’s the guy who rises to the occasion when it really counts. Among Toronto FC’s seven MLS seasons and dozens of rostered players, DeRo is the only one you can point to who ever brought that to the pitch. The 2013 DC United team he played for was hampered by injuries, including his own, and was consistently horrible in running to a last place finish in the league. Nevertheless, DeRo lead that squad to win the US Open Cup. No surprise, really, those big games are his best. In his first stint in TFC red, he was that hero. He brought the team up. Last time, it sometimes seemed like he had to do it on his own. His teammates on the field and the management backing them really weren’t a high enough calibre. It could make him seem like a ball hog, and a ‘me-first’ kind of player. Though, that really seems unfair. In San Jose and Houston, he also had a proven talent for serving up opportunities for other goal scorers. Maybe Brian Ching could offer some testimony there. Surely this year, with mounting expectations of Dafoe and Bradley, there will be games when injuries and tactics and morale are all flagging under the pressure. 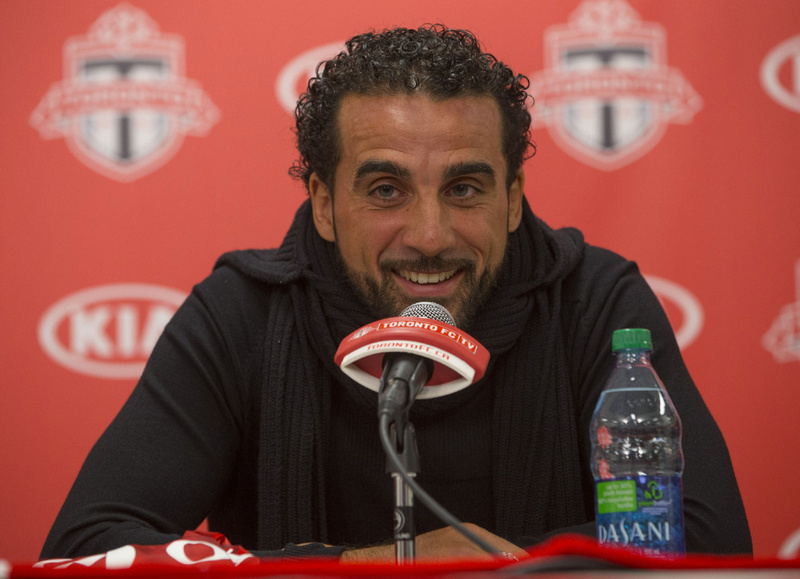 Those are the moments TFC will appreciate having DeRo around again. As long as he’s healthy, DeRo will always show up when somebody needs to deliver. That alone, makes his return to TFC one of the best developments of this off-season. Starting or coming off the bench, scoring or feeding others, DeRo is a guy you want on the field when the pressure is high and the competition is hot. Dwayne – whatever hair design you show up with, whatever goal celebration you peacock, it’s good to have you back.